Metcut conducts tensile, compression, and flexural tests on a wide variety of metallic, intermetallic and materials in air at temperatures ranging from -320°F to 2200°F. 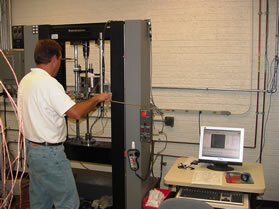 Our Tensile Testing Lab features two computerized Instron® 4505 electro-mechanical test machines of 20,000-lb capacity with MTS Test Works control packages. Test data is stored at Metcut and is readily available in text format for customers who wish to perform their own data analysis. We also use a Satec Electro-Mechanical tensile machines of 50,000-lb capacity also with MTS Test Works control.